I know the brain can modify the diameter of the cappilaries, it is also true that the brain, under certain circumstances can "create" pain but in your case it looks to be something else. It looks similar to photosensitivity as for example seen with the use of Doxycycline. If a person on Doxycycline goes more than say ten minutes into full sun, what happens is ever-stronger pain and redness that takes a few days to fully dissipate - if there is no sun exposure whatsoever in the meantime. You are not on any kind of medicines that could have photosensitivity as a side effect, right? Well - we will see what your dermatologist says. You should definitely buy a sun hat and wear it until your skin condition improves. You also mentioned in your previous postings that they ran some tests. Did you recieve the results? To soothe the skin, try a cream containing Dexpanthenol or Pantothenic acid. It may have a different name in the US. 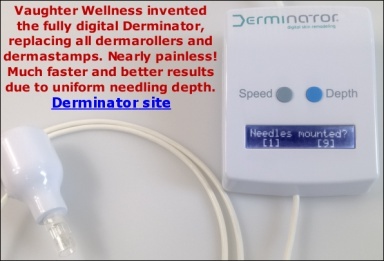 The difference between the 1 mm and 1.5 mm dermaroller is that a 1.5 mm dermaroller reaches deeper into the dermis part of the skin (and it is more painful than a 1 mm). They both trigger collagen but if you have scars, a 1.5 mm is a more appropriate size. You should avoid the sun as much as you can (wear a hat and sunscreen and do not suntan) for at least three days after dermarolling with long needled dermarollers. You can of course go outside, but protect yourself as much as you can. After that, use a sunscreen and do not catch sun for some more days. You can start with your treatments now, no problem. One week before your beach holiday, stop dermarolling. Dermarolling is a relatively new method and you cannot find any long-term follow up studies. Dermarolling is a safe method of skin rejuvenation because it doesn't remove any layers of skin, it doesn't use heat (heat can potentially cause hyperpigmentation, receding fat or necrosis), it doesn't thin the skin, it doesn't cause long term inflammation, it doesn't burn the skin, and since only fractions of skin are treated (each dermaorolling prick is surrounded by untreated skin) it heals extremely quickly. Many of us accidentally pricked ourselves with a needle and there was never any side effect. Dermarolling is principally the same, only the needles are much thinner than a for ex. a sewing needle and you make very many pricks in one go. You can use Emu oil. Yes, I have been dermarolling for about three years and I have tried all products that we sell. The most amazing result was on my décolleté where I rolled for quite severe sun damage and my skin looks really good there now. Surprisingly, the deep wrinkles around my mouth improved more than the relatively shallow wrinkles around my eyes. I had to use a numbing cream when rolling around my lips. I had no scars so I cannot report about that and I do have cellulite but I am past the age to bother about cellulite. I was also rolling and dry brushing my forearms for skin laxity and it also improved. Not to the point that it looks 15 years younger but it is a noticeable improvement. Yes you can roll with a 0.5 mm dermaroller in between the 1.5 mm. Wait for 5 days. If you have crusts (after single needling for example), wait with any rolling or dry brushing or exfoliation until the crusts are completely gone. Dermarolling / Microneedling / Can dermarolling make stretch marks worse? It is normal that stretchmarks look red and swollen after rolling. Redness or other changes are an ordinary part of the healing process and it will subside. It can take from several days to several weeks. The longest healing time required is usually after single needling. You should use a 1.5 mm dermaroller every 3 weeks. Restylan usually lasts from 4-9 months, exceptionally a year (especially in the areas where there is very little muscle movement such as under the eyes). I would be very surprised if your "chickenpox" is remaining Restylan but maybe it is. Yes you can roll over it, it might even speed up its diminishing because it is superficially injected. If your bumps do not disappear, go back to your doctor. They can inject the bumps with an enzyme that breaks up hyaluronic acid, the active ingredient of Restylane. If you had fillers injected, wait six weeks with dermarolling using long needles such as 1 or 1.5 mm. You can roll elsewhere but do not roll for six weeks over the injected areas. Blackhead pimples are basically "plugs" in the pores. The blackhead is oxidized sebum produced by sebaceous glands in the pore. So the holes you are talking about are pores. Restylan would be an option but it only lasts between 3-9 months. The more muscle movement in the area, the shorter it lasts. There is very much muscle movement around the lips.. It also depends how quickly your body metabolize it. I am always so happy when I hear someone got improvement. It is not easy to improve skin, even a little improvement is very good news. Both A-Ret and vit. C have to be applied in the evening because they are sensitive to light. They stay in the skin for several days so you do not have to apply them every day. You can do it in turns- one day vit.C, the next day A-Ret or even less frequently - each twice a week or so. If your skin gets dry, apply it less often. A dermaroller can only affect the skin and not the underlying structures. A dermaroller can improve only one of them and that is the loss of skin elasticity. Wrinkles between the eyes, above the lips or on the forehead respond well to dermarolling but the nasolabial lines or marionette lines deepen due to the dropping down of underlying structures of the face. It is more a crease than a wrinkle and a dermaroller has a very limited effect on creases. It can slightly thicken the skin but it cannot solve the cause of the creases. You should use our 1.5 mm ONE LINER dermaroller (or 2 mm ONE LINER) on the lines for intensive scar or wrinkle treatment and a regular 1 mm dermaroller (or longer) to tighten the facial skin.. If you tighten the facial skin by dermarolling it will likely reduce the nasolabial fold but it doesn't address the main cause – the drop down of fat and other structures under the skin. Since you say you have them whenever you smile, I have to assure you that it is completely normal and even children's skin ripples and creases when they smile (and to a certain point even when they do not smile). When you smile, the skin has to crease - there is no other way. Expression lines around the eyes or on the forehead can be diminished by dermarolling or by paralyzing the involved muscles by Botox but you certainly do not want paralyzing your smiling ability..
@Soon: I am delighted you have good results! Thank you for informing us about your regimen. You are in fact our first customer reporting pore size reduction. I hope more customers achieved the same but just did not report it. Dermarolling / Microneedling / Here we go! Good luck and keep us informed on how you fare! Keratolytic agents are for example salicylic acid, urea, lactic acid, and allantoin. They are used in creams for cracked heels, callus removal or Psoriasis and contain about 5% Salicylic acid and 10 % Urea. You can buy Kerasal(tm) or something similar. Salicylic acid is often found in acne products. Unfortunately I can't recommend a source. Oh - thanks for reporting these positive results Anna! :-) Actually I have just had a row of those unfortunate days when anything that can go bad, goes bad (famous Murphy's law), including that our washing machine broke down and I was craving to hear something positive to cheer me up. I am really happy it works for you! What is important is that a pea size amount of A-Ret is enough for the entire face. If you use too much, you will get irritated, red skin. You do not have to apply it every day either but if you have no problems with daily application (dry skin, too much peeling or irritation) then it is OK. Yes, you have done it correctly. Our skin is our main protective organ and feeling pain is our body's protective reaction, otherwise we would seriously injure ourselves without even noticing it. If you soften the skin prior to dermarolling (by having a hot bath, steaming your face or using some keratolytics such as salicylic acid) it should be a bit less painful. Occasional pinpoint bleeding is completely normal but we have customers who get no pinpoint bleeding on the face with a 2 mm dermaroller and also those who get quite some pinpoint bleeding with a 0.5 mm on their face. Both it is OK. It depends on the thickness of your skin, on the density and depth of vascularisation etc. Doing very deep dermarollings (3 mm) with lots of blood should be done only in a clinical setting. There is no evidence that those very deep dermarollings are more effective than deep dermarollings (such as 1.5 mm). You can go deeper locally with the single needle on individual deep scars. In order to induce collagen, you have to reach the dermis. In most people, a 0.5 mm dermaroller already reaches the top of the dermis (it depends where you roll because the thickness of the skin varies in different skin areas and skin thickness in general varies in people). Oh, now I noticed you did not write -very deep rolls- but -heavy rolls-. I am not sure what exactly it means. Deep or dense or both? Honestly, nobody knows what dermarolling regimen is absolutely optimal for various skin conditions. It doesn't mean that doing a less optimal regimen will not bring results. It will just take a little longer. When you know how your skin reacts to dermarolling, you can roll more densely. There are people with very sensitive skin that cannot handle dense dermarolling etc. That is why my instructions are always on the conservative side, and our customers can adjust for their skin type and needs and even experiment a little. No, you do not have to see blood. A 1.5 mm dermaroller always reaches the dermis and the redness is typically gone within a few hours. When the skin turns red after demarolling, it means the intended processes were triggered. Your body initiated the repairing process of the microdamage you intentionally inflicted with the dermaroller and the scars will hopefully get partially remodeled in that repairing process. The skin is not always visibly peeling after dermarolling. Apply just mild pressure on the dermaroller, certainly do not push it in too hard. Everything you described appears to be perfectly OK.
Dermarolling or dermastamping is successful in reducing or improving scars but unfortunately it seems it doesn't do much for pore size. Pores are ducts in the skin and their size is in our genes. You cannot change that. So far I have not heard success stories from our customers concerning reducing their pores. (They report improvements in scars or pigmentation etc but not in pores). There are currently no methods that can significantly and permanently reduce pore size. Acid peels in some cases reduce pore size but only temporarily. Some (not many) customers even wrote me that after laser treatment (intended to reduce pore size), they ended up with larger pores than prior to treatment. If you have scars, there is a big chance for improvement but if you have "just" pores, the chance is small. Yes, a dermastamp seems more suitable than a dermaroller in your case. You can use it every day but do not stamp the same scar more than once a month. No, vit. C should not be applied right after dermarolling with long needles. It is acidic and it would sting. Apply vit. C two or three times a week for general skin care (vit. C is very important for the skin). Apply it also for four consecutive days prior to dermarolling or dermastamping to achieve maximum skin levels for the day of treatment. Restart applying 2 days after dermarolling and apply it two or three times a week. Vit. C is sensitive to light so apply it before you go to bed. A copper peptide mask can be applied right after dermarolling but some customers ended up with temporary red skin, Do a test patch on a small skin area to see how your skin reacts if applied right after dermarolling. Dermarolling / Microneedling / When am I likely to start seeing some improvement in my stretch marks? Well, that is hard to answer..
We have been selling dermarollers for more than two years and I sometimes get emails saying that it took more than one year of rolling or/and needling to see results and often even longer than that. It doesn't take always that long. Typically, you should see some kind of improvement within ten months. However, if you do not get improvement, don't give up sooner than after two years of regular dermarolling/needling. The results of dermarolling are cumulative and almost everybody gets improvement with persistence and patience.